The profession of a blacksmith is believed to have originated during the Iron Age. When many think of blacksmiths, images of historic times come to mind along with horses and carriages. However, there are still some in this day and age who make a living from the profession. 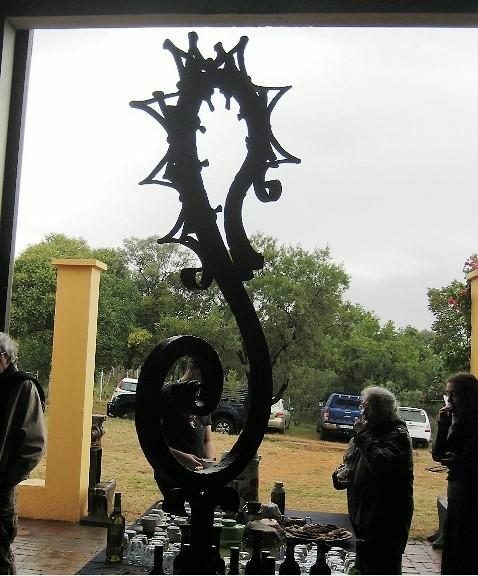 Master blacksmith Paul Mikula hosted his unusual exhibition held at Saartjies Nek near Hartbeesport Dam and guests were able to marvel at some of his magnificent creations. The profession of a blacksmith is believed to have originated during the Iron Age when it was discovered that some type of rock would give up a substance when heated and then solidified once cooled down. Small pieces of iron ore were placed in a clay furnace and after a few hours a small piece of iron was produced. This piece of iron, also known as the bloom, would be hammered into the desired shape to produce tools and weapons. Iron making spread across Europe and Britain and blacksmiths were in in high demand, taking on roles of armourers, sword smiths and chain makers. Sandton resident, Paul Mikula, recently had the privilege of representing not only South Africa but the entire African continent with his winning creation of a springbok head which he forged in Ypres, Belgium. Mikula was one of the top blacksmiths from around the world who were invited to create panels around a colossal new cenotaph to commemorate the centenary of WW1. Mikula forged the Springbok head out of an old 1913 light wagon axle used in WW1, forgoing his passion for using ‘old iron with soul’ for his creations. From artwork to axe heads, gates, balustrades and commissioned creations, Mikula is certainly ‘forging’ ahead with his imaginative work.